The strike-down of the ban is a key victory for gay rights and a big step in the direction of marriage equality, so to celebrate I’m delivering van Gogh Roses (1890) today. Vincent (1853 – 1890) was born the son of a Dutch pastor, and was early on employed by the picture dealers for whom his brother Theo worked. He didn’t begin to become an artist until he was destitute after his dismissal from the mission (he’d intended to become a priest) in 1880: art sparked for him in 1886 when he went to Paris and met with Impressionism. In 1888 van Gogh became fixated on the idea os establishing an artists’ colony in the south of France. After setting himself up in Arles he invited Paul Gauguin and others to join him. Indeed van Gogh appears to have become infatuated with Gauguin, with some suggesting that their blistering fight, which lead to the famous ear incident, was behind van Gogh’s suicide in 1890. Most will know about van Gogh’s tragic demise into mental disturbance, but the time he spent in institutions was also fervent and fruitful for his art. 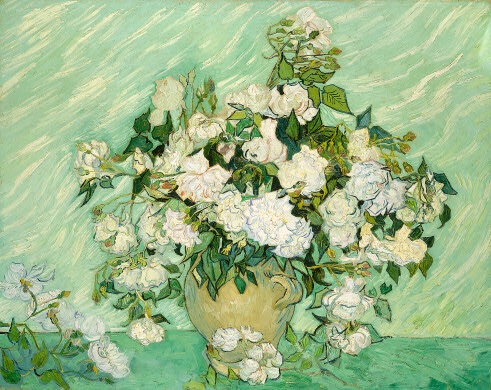 This piece for example was painted while he was in an asylum at St Rémy, one of two rose paintings he made at the time. Roses didn’t have an especial meaning for the man, I don’t think, but I do believe he thought of plants as emblems of birth and renewal. Perhaps painting Roses was part of a healing process, as his words suggest an eager energy: “… in a frenzy. Great bunches of flowers, violet irises, big bouquets of roses…”. This still-life is pulsing with active life: it’s in the choice of colors, from a fresh-mint green background to a sea green surface. Elsewhere forest greens fizz with a varied palette of neutrals that feel clean and pure. Originally these roses were pink (their color has faded) so imagine the optimistic compliment of green and pink we’d have seen. The paint is properly pasted on: fat ribbons of it drive around (there’s especial energy in the diagonals at the back). So piled on is the pigment, in fact, that van Gogh left both rose works at the asylum when he left on May 16: “These canvases will take a whole month to dry, but the attendant here will undertake to send them off after my departure”, is what he wrote to Theo. They arrived to him on June 24, days before he shot himself.